Passionate in entrepreneurship, project management, talent development, exponential technology and youth leadership is our inspiring personality Mr. Teoh Chon Giap. He has been managing projects/events since early age, and is, currently, a full time event organizer. One of the most recognized projects that he organizes annually is "TEDxYouth@KL". TEDx basically represents the words Technology, Entertainment and Design (T.E.D). The TEDx Program is designed to help communities, organizations and individuals to spark conversation and connection through local TED-like experiences. It is planned and coordinated independently under a free license granted by TED.com. 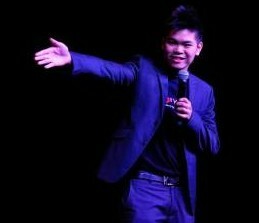 He is the curator and the Sponsorship lead of TEDxYouth@KL, 2012 - 2014. This event is recognized as the largest TEDxYouth Event in South East Asia. The seats were sold out in the time frame of 2 weeks prior to the event with 800 enthusiastic youth leaders. The event has been featured on Malaysian Newspaper, Radio Station, Television, Magazine, and Online Media. Besides, he has done project management events that have people up to 3,000 capacities too. 1) Be purpose drive. Knowing why you are doing something drives you forward; it helps you to persevere through challenges. It helps you to communicate clearly with stakeholders, leaders, teammates, clients, and even friends. 2) Be persistent. Either it is for personal development or business growth. Make sure you are growing with the things you are doing. In the case of business, it's all about bringing profits in business. I am involved with sales. Therefore, I have to measure how many sales or profit I am bringing into my company weekly. How many appointments you make a day, and how many sales have you closed? In this way, you are able to track your progress and learn how to grow faster. 3) Be an explorer. Be curious. Ask questions. Imagine stuff. Talk to people. Read a lot. Keep Learning. Explore. Dream. Discover. "Starting a business is easy; the challenges are how you manage and make it scalable," emphasizes Chon. The recruitment application opens through Facebook. Applications get strictly filtered to make sure that the project volunteers/employees believe in the vision of TED or TEDxYouth@KL. Chon says, "We believe in a vision of 'Ideas worth spreading. We are providing a platform to allow people to learn, share and discuss new or interesting ideas from the T.E.D industry." Chon Teoh believes that the project's organizing team is one of the greatest assets. Their majority teammates are from age 19 to 23, who are Generation Y's. "We promise everyone in the team that we will grow and learn together. Everyone is given a fair chance to show their capability and leadership opportunity. We truly understand what values that Gen Y's want are, and we are able to feed them with what they need and want. That kept them wanting to work with us," explains Chon. The world is entering a period of accelerated technological change. Today's technology has changed all of our lives, the way we communicate, the way we learn, the way we travel, and, of course, the way we run business. Being a tech-enthusiast too, Chon shares, "If you look at the implications of exponential growth it creates a very different picture of the future and it's not intuitive." These are the words of Ray Kurzweil. Problems that may seem intractable now could become eminently solvable in the near future. Not only should this inform investing and planning for the future, it should also change what you think of as possible for humanity. Soon, things which we could barely have imagined decades before might be within reach. Success is a universal desire that many of us strive to achieve in our lives. We all aim to lead successful lives. It is the reason we educate ourselves and work hard. We believe that it brings us joy and gives meaning to our lives. Success is a journey and not a destination according to Chon. Chon advocates, "It is not necessary that we are only successful when we achieve something. It is what we are doing daily that defines whether we are successful or not." Chon's words on one's growth and bringing positive change in life: "look for someone that you admire a lot and wish to be like that person. Ask him/her to be your mentor, learn the tips and tricks from that person and work hard with the things you want to do. I can assure your growth will be exponential." Steve Jobs, Elon Musk, and Jack Ma have been Chon Teoh's role models inspiring him to be a visionary. A quote that he came across when he was 16 years old was "Master Your Mind, and Design Your Destiny" which changed Chon's life.